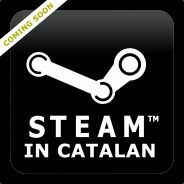 This group is for everyone who wants to promote Catalan as an official language in the Steam client, Store and in other applications. Feel free to join! We have a client translation so we only need to have a large group of people supporting the Catalan as an official language in Steam. Este grupo es para todos los que quieran promover el Catalan como lengua en el cliente de Steam, la Tienda y en otras aplications. ¡Únete! Tenemos una traducción del cliente hecha así que solo necesitamos un gran número de gente apoyando el catalán como lengua oficial en Steam. la Tenda i en altres aplicacions. Uneix-te! recolzin el català com a llengua oficial d'Steam. More information: Catalan is one of the official languages spoken in Spain. Approximately spoken by 7 million people, you can hear Catalan mainly in Catalonia at the north-east of Spain, in Valencian Country at the east of Spain, in the Balearic Islands, in the small country of Andorra, southern France and Alghero, and in the Italian island of Sardinia. Now, it is the 9th language in number of speakers in the European Union and it is the 26th language in the Internet. "Games that can be played in Catalan"
Jo ara estic fent-ne difusió per les xarxes socials. Continuem demanant el nostre idioma a l'Steam? eps boness a tos i totess!